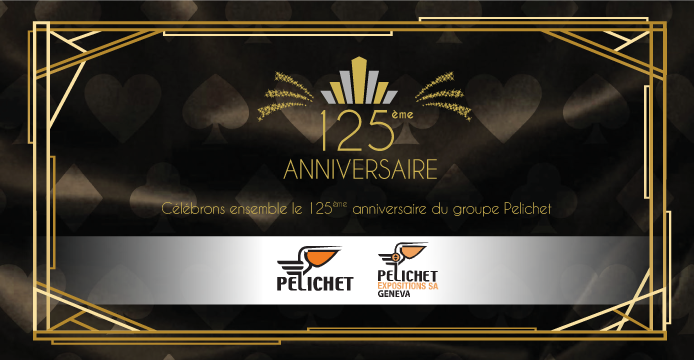 The Pelichet Group is pleased to celebrate its 125th anniversary in 2016 and marks the history of its company by organising an unforgettable event at the “Réserve” at Bellevue! In this special newsletter, we are also reviewing the history and growth of the Pelichet Group. To celebrate its anniversary, Pelichet organises a magical event! Inspired by Fred Astaire and the Great Gatsby, the Pelichet Group invites its clients and partners to an amazing and fun night. To immerse its guests in the enchantment of the 20’s, Pelichet recreates the atmosphere of the golden years in Geneva. The elegant dress code of the time being required, guests will make a journey through time to enjoy a night mixing dance and glamour as in the prohibition era in America. The more adventurous will ice skate on the largest private ice rink in Geneva, and those who feel lucky will bet on the famous Black Jack table. For the lovers of delicacies, they can taste the culinary specialities of the Lodge d’Hiver restaurant. Established in 1891, the origins of Pelichet illustrated the company’s commitment to innovation and customer service – that eventually became its trademark. Albert Pelichet, aged 20 at that time, opened his shop in a small street of Geneva: the street of the future. As a young butler, Albert helped a wealthy Swiss family during their seasonal moves, and found he had a unique talent for the organisation of these removals. He decided to do it as a job, offering his services to other wealthy Swiss families – and that is how Pelichet was created! As Geneva grew, Pelichet grew in the same way. A growing number of employees and international companies came to Geneva, exposing Pelichet to new opportunities with an international customer base, and the city flourished as a centre of diplomacy and business. Indeed, one of Pelichet’s flagship projects was the relocation of the League of Nations (United Nations ancestor) to their new headquarters in Geneva in 1936-1937! A pioneering company, Pelichet continues its international growth and complements its removals offering with a range of mobility services. Throughout its history, Pelichet has invested in the international trade and a key moment occured in 2006 with the opening of the first subsidiary of the company outside Switzerland, in Paris. In 2011, Pelichet’s presence on the international stage gained considerable momentum when the company joined the AGS Group, with its 183 locations in 85 countries. The following year, Pelichet inaugurated its new premises in Vernier, on the outskirts of Geneva, which boasts a state-of-the-art 20,000m2 containerwarehouse equipped with a computer controlled bridge crane. “In the 125 years of its existence, Pelichet has kept customer satisfaction at the heart of its concerns, and continues its growth by relying on this winning recipe as the company develops its international removal activity and office transfers” explains Samuel Barrois, Pelichet CEO.